This pattern was requested by a Crochet Spot Reader! The classic hooded cardigan sweater is now available in adult sizes! The cardigan is crocheted from the top down in one piece with no sewing required (other than sewing on the buttons). Top down construction allow for the sweater to be tried on as you crochet, so that you can easily adjust the size if needed. This pattern contains 9 sizes ranging from X-small to 5X, and the instructions will help you customize the sweater for a perfect fit. 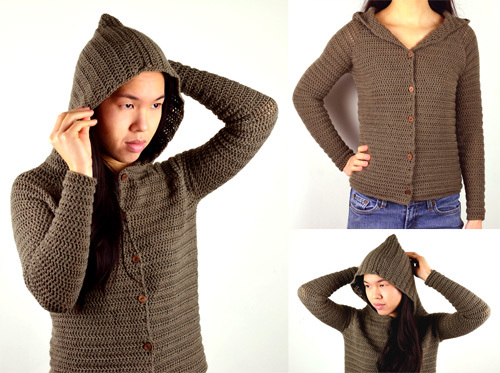 The baby size and the children size hooded cardigan patterns are also available in the store. This entry was posted on Sunday, January 22nd, 2017 at 10:25 AM by Rachel Choi	and is filed under Best Crochet Patterns. You can follow any responses to this entry through the RSS 2.0 feed. You can skip to the end and leave a response. Pinging is currently not allowed.